Education Reform – Why am I involved? PARCC Test Prep given on the third week of Kindergarten. After the debacle of my first child starting kindergarten last August, she was a shadow of her happy, bouncy self. She was exhausted and weary by mid-September. All this because she started kindergarten in the wrong school. What’s worse though is, while I know I won the lottery with her new school, her old school is only following orders from up high. The district school board and the state of Florida have their hands, pockets (and asses) deep in the system, a system that is crumbling while simultaneously shattering children’s self-esteem, burning out students of every grade, and materials being taught only to suit the answers on a specific test. Just those 5 weeks in her old school made me so sick to my stomach with stress and anxiety that I was barely able to function. What she was exposed to in her old public school is what every student has to face across the state and it’s unacceptable. Her first week of kindergarten, she came home with an hour of homework every night, photo copies of the PARCC test for her to fill out, and an ad nauseum regurgitation of letters that rendered homework a complete nightmare every single night. After three weeks of this, I timed her homework. It took one hour and fifteen minutes. I was done. DONE. The next morning, I told her teacher to expect her homework to routinely be returned incomplete. I was not going to subject my child to this at aged 5. The teacher, whose hands are tied thanks to the system, agreed wholeheartedly. Began talking about retiring after she warned me that the homework would only get worse after Christmas due to the EOC (End-of-Course) tests they’ll all face at the end of the year. What? The EOC for kindergarten is another set of tests – yes, I said ‘set’. The EOC for kindergarten comprises of 186 questions over the course of two weeks in May. So kindies all over the state in a public school are working solely towards this test. That’s just for math and english. Doesn’t include the tests for the other subjects!!!! Not only is this bad enough, but the tests counts for nothing for the students. It’s meant as a means of benchmarking the teachers. I happened to talk to my girl’s school principal early this week. He told me that he’s not even sure they’ll bother with the kindie EOC. He knows what his teachers are like. While the final decision hasn’t been made yet for her school (hers is a charter, so they are allowed more freedom than the standard public school), I’m going to have my ear to the ground just in case. Two weeks of testing is bad enough. Two weeks of testing that has zero merit for the child is downright ridiculous. And this is just the beginning. Currently, all grades have EOC tests, and when you get to 3rd grade, you get to take the FSA (Florida Standards Assessment). Detailed info here. Initially, it doesn’t sound so bad. 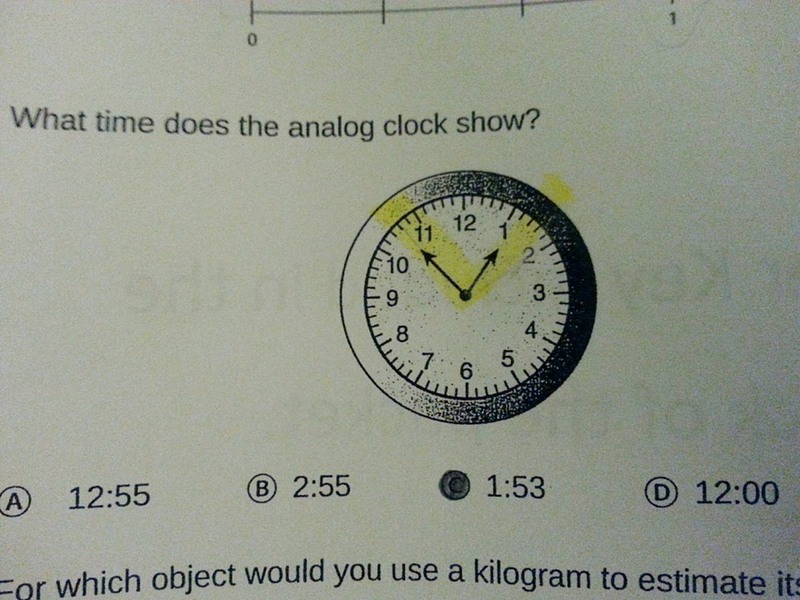 But then practice tests were sent home and the questions defy logic. For example, take a look at the clock. How are the hands positioned? Which is the hour and which is the minute hand? Maybe this question is better? What’s the answer??? Anyone? Anyone? I’ll give you the answer below. When I say “answer,” I really mean I’m giving you the correct answer as designated by the test and by which the students are compared to. Expectations are that 70% of the students will fail this year. Who the hell approves and administers a testing system where 70% are expected to fail?? My hurricane is three years away from having to do the FSA but when the time comes, we know she’ll be opting out. We in no way wish to damage the school’s rating so we will follow very specific guidelines to achieve an NR2 score which will meet the minimum requirement of participation without any repercussions to the school from the district school board. There are so many examples of this test. It’s wrong. Just plainly wrong. So my obligation as a parent is to get involved. I am guilty of prior ignorance on this matter but now that I have a child in the education system, I’m listening. I really don’t like what I am hearing. No more. I am writing this post because others may also not know about it and the more informed we are, the more we can become active, let voices be heard and stand up for our children. School isn’t school anymore, it’s a testing prep factory. And it’s time for that to end. 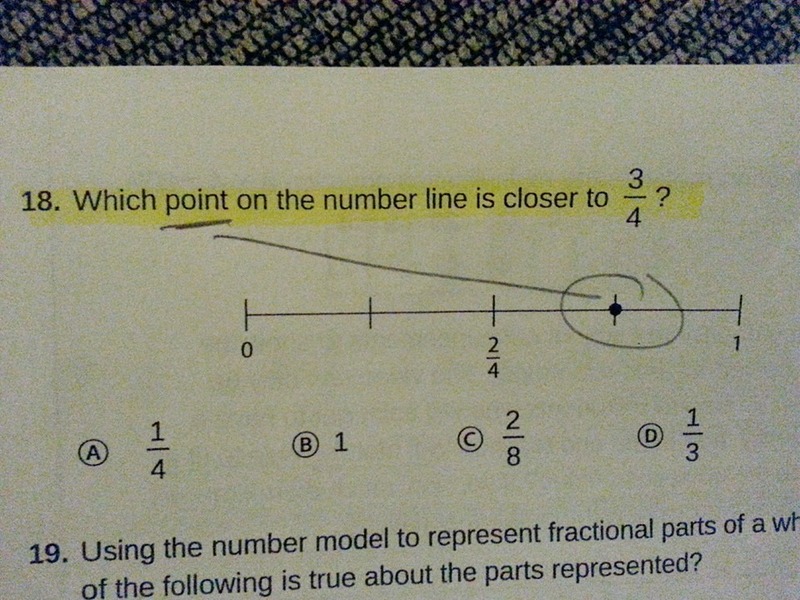 Oh, and the answer to the question above is B. Did you get it right? Long live the Queen. Queen of the fairies, that is. I’ve been missing from here, I know. At the end of January, we received the devastating news that my beloved aunt had ovarian cancer. 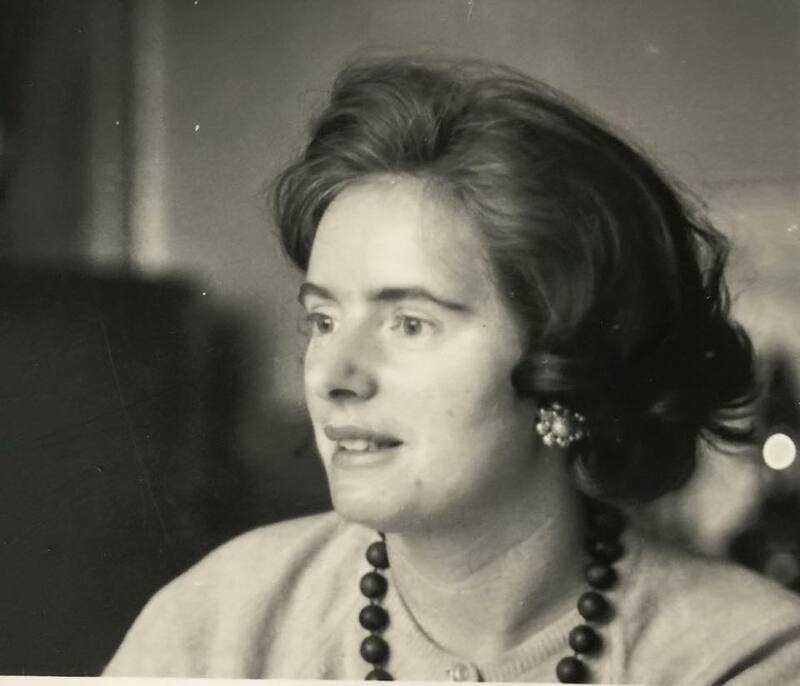 The word “aunt” is so incomplete because this woman was so much more than my father’s sister, and I’m not sure I can adequately describe what a powerhouse of love, happiness, caring, adventurousness she was. And then she had the audacity to die three weeks after her diagnosis. My sister and I raced across the Atlantic on the first flight when we got the call that things were going very badly. We touched down in Gatwick airport in London, England, desperate to hold her hand one more time. To see that sparkle in her eyes that used to light up a room, to hear her voice again. The minute the wheels touched the ground, I turned on my cell phone (I know, I know, but this was an emergency) and texted my brother that we had touched down. We still had another 6 hours to go before getting to the final destination in Ireland, but I needed to update the family so that we could feel included. The only response back was “call me please.” I turned to my sister, fear gripping my heart, and told her I think she’s gone, I think we’re too late. I called my brother straight away and he asked me where I was. I told him we were still on the plane, and he responded calmly that I should call him when we got off the plane. We sobbed for the next several hours as we transferred to Heathrow airport, waiting for the last flight home. We had missed her. We had missed it. Missed death. I had desperately wanted to be there for her when she died, just as she was there for me all through my life. I had wanted to soothe her, assure her that she was loved as much as she had loved us. She needed to know how much I appreciated her and what she had done. How she had changed my life when we were in the worst of times and made it not only better, she made our time with her magical. My darling aunt was 82 years old when she died, but her secret was that she was really Peter Pan. She loved fairies and butterflies, adventures and discoveries. She never grew up and as children, she was a magnet to us. A magnet of happiness and wonder, security and love. 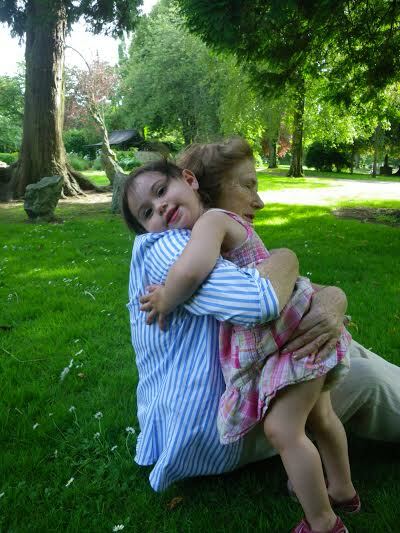 As adults, we appreciated her lack of adultness, watching in awe as she still marvelled at the world, at nature, and was able to still always smile, always give a hug, always touching our hands or arms in a silent gesture of love. No matter what the situation, she was able to see a positive and move forward. Help all those around her and persevere. She worshipped the wonderment of children, and invested heavily in keeping their dreams alive. 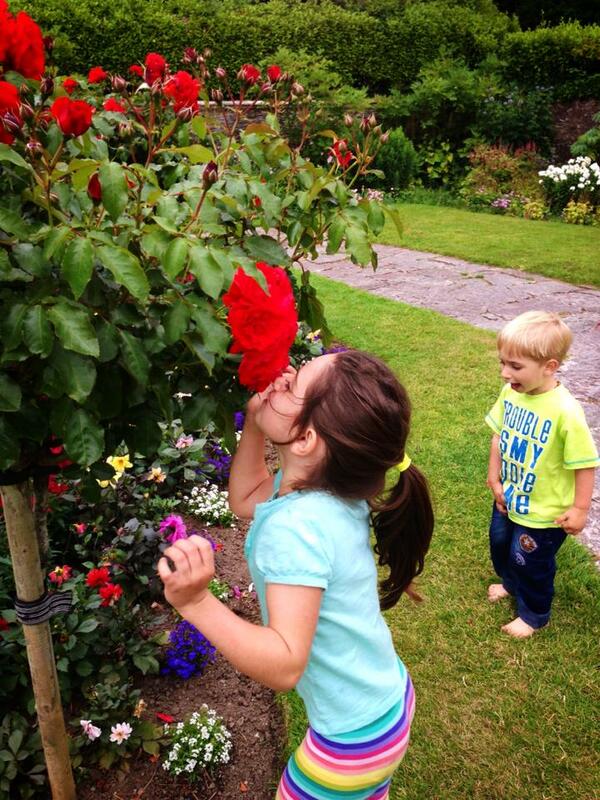 When my niece was seven years old, she walked up my aunt’s garden with my aunt, and found a fairy house. Still believing in fairies, my aunt encouraged her to write a letter to them and my niece left it in their little house. The next day, my niece checked on that fairy house and saw that, not only had her letter been received, the fairies had written back! That was the woman she was. Her house is covered in pictures and statues of fairies and gnomes since she was an avid gardener. She loved belly dancing, playing the piano, singing, dressing up in costumes, making the most out of life. A woman so wonderful that when she retired, the partner of the firm she worked at (boring accountants no less!) 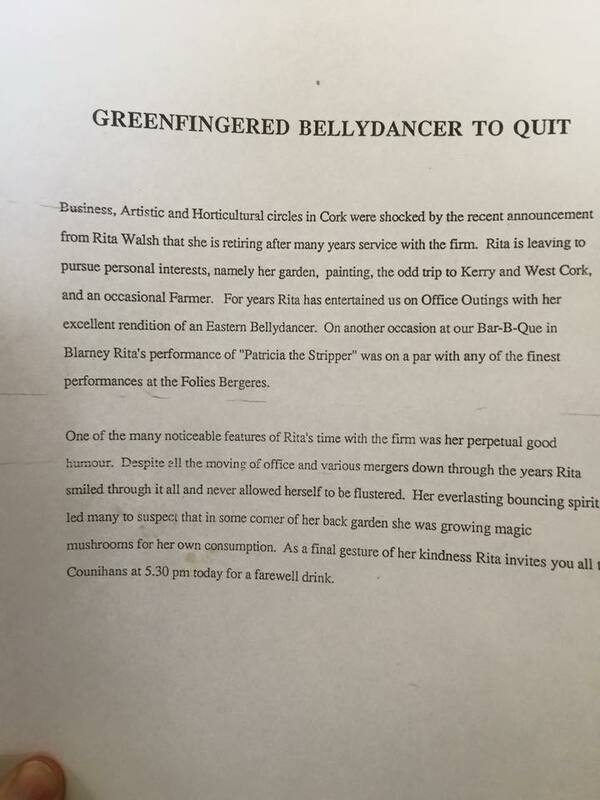 sent out a memo to the entire company announcing her retirement, titling the piece “Greenfingered Bellydancer To Quit.” Click on the picture to see the full memo. I walked through that house last week, Friday to be exact, knowing it was more than likely the last time I’d ever set foot in that house, that the symbol of security and love encompassing my childhood would be gone, knowing that I’d never hear that melodious voice again or see that gleaming smile. My heart broke apart all over again. However, the oddest thing happened while I was there for her funeral. I learned that she had told our cousin the day before she died, the day before our arrival, that she didn’t want my sister and I to see her “like this,” and while I felt slightly robbed of the opportunity to see her again in person, I understand what she did was completely out of love. Her final, biggest gesture of love was letting herself die. She let herself slip away into the other world before we arrived so that we could always remember that vibrant, larger-than-life lady. And she was a pure lady. Our family gathered, we shared stories of our aunt and laughed wonderfully. Even in death, she was still making us smile. We laughed, we drank, we reminisced, we connected, we smiled, and only occasionally did we let ourselves mourn because in keeping with her style, one would never be morose. Last night, I lay in bed thinking about her, and the gift she had given us. Because she was truly a gift. While we had missed her death, we were there for the most important part – her life. We were blessed to be a part of it. And while my heart feels like it’s broken, I realized that she had created that heart, taught it how to love, made it bigger and stronger than anyone else ever could and for that I am truly grateful. In 2002, I wrote her a card thanking her for being so wonderful to me, teaching me how to love and for showing me such love throughout my life. In 2012, I wrote another card to thank her for teaching me how to be a mother, because even though she didn’t have any biological children, she showed me how a mother loves a child. I thanked her, telling her every time she told me I was a good mother, she should know that she and my grandmother were the ones to show me what a good mother was. As I looked through her papers last week, I found both those cards that she had kept forever. I was stunned. Her heart was far bigger than her tiny little statuesque figure would make you believe. It makes me want to keep her legacy alive. To show my children the love and patience she showed me. To not get caught up in the minor details of daily life and to embrace it instead. As my sister said in her eulogy for my aunt, the journey was as important as the destination. That’s what we are all on, a journey. We can chose how we react, chose how live our lives, chose what is important. We can do it with a smile on our faces and appreciate the simplest of things around us. To not conform to the societal expectations given a certain age, and to simply live life to the fullest. To love unconditionally. To be happy. To appreciate the world around us. Appreciate the people around us. Therein lies the key. As a friend put it perfectly, everyone needs a Rita in their life. And more importantly, everyone needs to BE a Rita in someone’s life. Beginning Kindergarten All Over Again. Last year, I entered my girl into a lottery for two local charter schools that are rated exceptionally well. Lottery time came and went and we heard nothing. Just a few weeks ago, I learned she was #90 on the waitlist for one of them and I didn’t even bother checking the second charter waitlist. Who needs that kinds of rejection? Then midweek, I received a phone call from the second charter that a spot had opened up for her. Whhhhhhhhaaaaaaaatttttt????? It completely threw me for a loop and all of a sudden, I had to get days worth of paperwork together in three hours. I toured the school, asked questions that I wouldn’t have known to ask before (schedule, recess, homework, etc). I started feeling a little better and I enrolled her on the spot. That was mostly because the school is in such demand that they needed an answer almost immediately because hundreds of others were waiting in the wings. And I wasn’t going to let my girl sit in a school that is rated 5/10 when a 10/10 school was inviting her in. The new school groups students together based on ability, and thus teach to that level so no student is left waiting for others to catch up and other students are not left feeling inadequate. I know this particular school is very heavy on academics. It’s a nerd’s dream come true, which works for us because both my husband and I are nerds. So is my youngest. I have a strong feeling they’ll make the fit with my daughter too. Something that intrigued me greatly is that the school provides after-school clubs for 45 mins. These happen on-campus, and are mostly free. 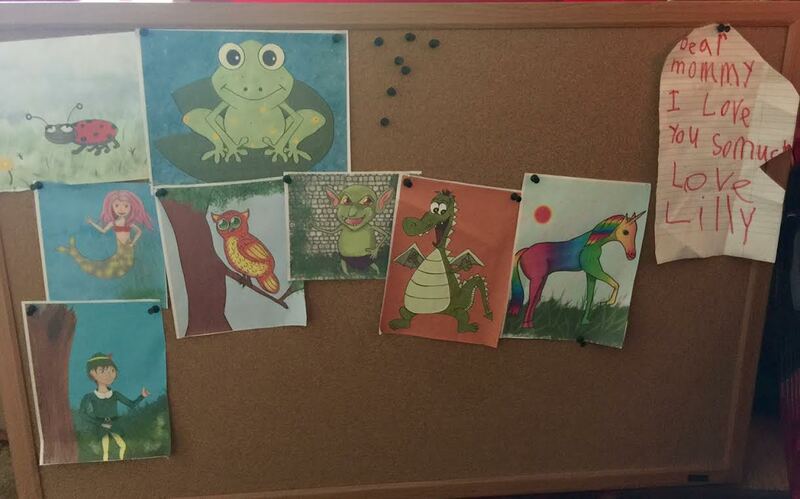 Clubs like art, reading, music, yoga (yes, yoga for K-2 grades), a fitness club, poetry, creative writing, an environmental club, theater, younger singers, a gaming club. What’s not to love there? Then, when the kids get to the third grade, the clubs mature to science olympiads, math olympiads, sports, gardening, newspaper club and more. The kids have recess every single day, as well as PE during the week, along with art and music classes. She also doesn’t have that mandated extra hour of school every day, like her old school. The only extra time is optional and will be based on my daughter’s interest in the item. She has a school uniform now. I’ll be sad to see the rainbow outfits disappear but it is what it is. I’ll take a better education over fashion. Tomorrow, my 5-year-old starts the new school. I was a little worried that she wouldn’t care for a transition so I asked her during the week if she liked her teacher, Mrs.V, and the answer was “No, not really.” Well then. For the record, I think Mrs.V is a great teacher and a sweetheart, but my girl did not take her to from the moment they met. After her final day at her old school came to a close (Friday), I drove her to her new school so that she wouldn’t have the weekend to wait and wonder, be anxious, about the new place and she was impressed. She liked it and I think we’re already off to a good start. She got to tour the four kindergarten classes, met two of the teachers and thought the rooms were fantastic. My shoulders have dropped two inches and while I was still awake at 4am this morning worrying about it all, I have a feeling (a hope) that in a few weeks, I might even be able to sleep through the night, something that hasn’t happened in 6 weeks, content that my girl is getting what she needs. I know I’m in trouble when I feel a little jealous of people who can lock their kids in a closet. The kindergartner was walking with me through a store last week when she spotted the highly coveted unicorn stretchkins. I am supremely confident that she would play with it for an hour tops, and then it would join the rather large pile of discarded teddy bears in the playroom. Our rule now is that we only buy toys for birthdays or Christmas, and if they want something specific, it’ll go on their wishlist until the next occasion. She had a rare freak out when I let her know we weren’t buying it that day. I turned it around to tell her that it was good she was upset, because that meant she really wanted it, so isn’t she going to have a nice birthday! Sneaky, I know. Today, I picked her up from school and along with the 3-year old mental patient, headed off to go back to the store. Made the drive OK. Even started the shopping OK. Until we had to walk by the stretchkins. I shut down any requests quickly, naively thinking that was the end of it. Until my 5-year old decided to try emotional blackmail. At that point, I actually started laughing which wasn’t too smart. The beast was already riled up. Now she was vying for anything she could to gain ground. Demanding Hello Kitty yogurt. Grabbing a book that was for her brother. Rebuking any consequences I was giving her. After about 10 minutes of insufferable behavior, and aware other people are around me so I can’t really scream the immense frustration I feel, I do something I have never done before. She was standing on the side of the shopping cart. I simply picked her up and placed her next to a freezer aisle. Without a word, I walked away. I didn’t even glance back as I walked forward, wondering how far I needed to go before this bluff was called. It wasn’t far. I got about 15 feet away, and I heard a sobbing, “Moooooooommmmmmmmmmmm.” My intention was not to make her cry, it was to jolt her out of whatever attitude was going on. And it worked. We discussed how I was never going to leave her there, that I merely needed some space because her attitude was something I couldn’t be around. I told her how much I love her but that she needed to rethink how she was speaking and behaving. Then I told her to give me the biggest hug she possibly could, give it her best shot, squeeze me so tight that I couldn’t breathe (I should be careful here! ), and she did, laughing hysterically. And that was the end of the effing stretchkins. Mental note has been made. She will never come to this store with me until after her birthday. Aaaaaand it started. The kindergarten struggle. Even before Meet the Teacher, the signs were there. My spirited five-year old didn’t want to go. When we entered the classroom, my tornado did all she could to avoid the teacher. During that visit, I learned about the extra hour that has been tacked onto the school day. That alone had me terrified and consumed my entire weekend. I’m already dubious about the lack of organization in this school. Carpool on the first day was bedlam because newbies like myself were screwing it all up. No one told us what to do. Just like no one explicitly explained the extra hour on the school day. Or what activities the kids do. There has been zero communication from the school apart from a robo call telling us the date of Meet the Teacher. I feel like I’m flying blind so now I’m getting a glimpse of what things are like for my child, who has no idea what is going on. The first day of Kindergarten arrived and I walked her to the auditorium, hopeful that she would enjoy it all. I picked her up eight hours later (yes, eight!!!!). I had dreams of delightful songs, fanciful art work, best friends for my girl. She got in the car, strapped herself into her car seat. I delightedly asked how her day was and she responded, “I didn’t get a star today. I wasn’t good enough.” Whhhhhhhaaaaaaaatttttt? Again she says, “I just wasn’t good enough.” My heart breaks, my head starts spinning, I’m trying to focus on not crashing the car because of the seething rage burning inside me. This is what her first day of kindie has taught her? I’m crushed and devastated. We get home and I ask her for more details. Did Mrs.V tell you this? No. Did you make any friends? No. What happened? Nothing. Again, I spend the evening crying (out of child’s view), cursing what I’ve done to my child. When I wake my love up for school this morning, she tried ever so hard to persuade me it was Saturday. We finally got out the door and I walked her to the auditorium again. I met Mrs.V and instead of turning into Momma Bear, I politely asked if she knew why my girl would say she wasn’t good enough. Mrs.V then explains that my hurricane wouldn’t participate in anything. When she was reading to her, asking what letter this was, my girl would respond with “No.” She apparently spent most of the day in the corner of the room, after my daughter recused herself from the activities. Her teacher said to give her some time to adjust. I simply don’t know what to do. I know she’s a strong-willed child. A stubborn individual with her own agenda and own way of doing things. As a side note, I cannot possibly imagine who she got those traits from (insert dripping sarcasm). There’s a couple schools I’d love her to attend. One is a charter school that is very close by, but she is #90 on the wait list. The other does not have any open spots and will not accept a waiting list. I feel like we are trapped. Being new to this school stuff, I don’t know if it’s something that will iron itself out over a week or so, or not. I don’t know if it’s my daughter that is the problem, or the teacher, or both. It doesn’t help that the disorganization of the school has undermined my confidence. I keep remembering last year, when she attended another school. Unfortunately, they don’t offer elementary education. She ran into that classroom every day. By day two, she had made a card for her teacher to tell her how much she loved her. Now she is defeated. In Kindergarten. After one day.